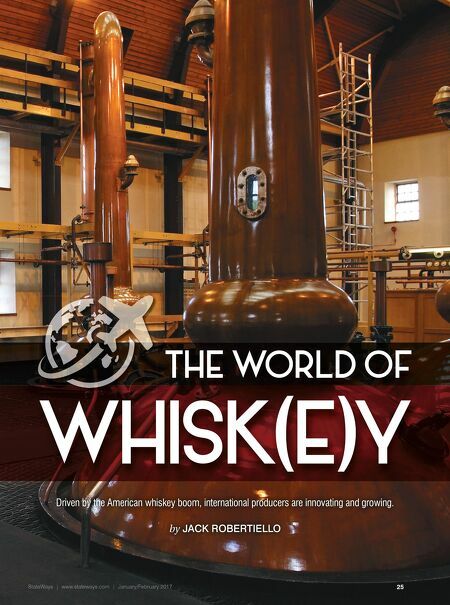 StateWays | www.stateways.com | January/February 2017 24 L ost beneath the hubbub about the boom in American whiskey are some exceptional numbers in the U.S. for the rest of the world's whis- kies. For example, while the spirits industry has grown accustomed to year-on-year growth from single malt Scotches, last year blended Scotch bottled in Scotland also saw a remarkable turnaround, growing more than 5% in volume. Similarly, Irish whiskey, long driven by the strength of Jameson, has also continued to grow apace, with new brands and line extensions broadening the fl avors, ages and price points available in the category. This is preparing the ground for brands on the way from the 20 or so new Irish distilleries in the process, at one stage or another, of producing whiskey. And the Japanese whisky phenomenon, while small in volume, can't be ig- nored - as soon as shipments arrive on these shores, they disappear - mostly to on-premise accounts, but with many specialty retailers grabbing their share as quickly as they can. Overall, what's happening as the American whiskey boom spreads interna- tionally has important resonance for all producers. "The widespread boom in the Bourbon and rye market has created opportunities for whiskey brands to attract a diverse set of consumers with new and innovative products, including different fi nishing methods," says Sona Bajaria, VP, Marketing, The Glenlivet and High End Irish Whiskey for Pernod Ricard. "The growth in this market has sparked recruitment and consumer interest that has allowed new drinkers to explore diverse and innovative options," Bajaria adds. "However, this does present a unique challenge, in that differentiating the offering becomes of most importance." 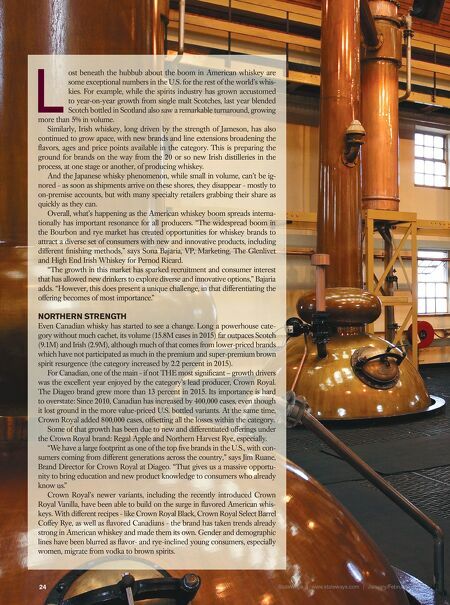 NORTHERN STRENGTH Even Canadian whisky has started to see a change. Long a powerhouse cate- gory without much cachet, its volume (15.8M cases in 2015) far outpaces Scotch (9.1M) and Irish (2.9M), although much of that comes from lower-priced brands which have not participated as much in the premium and super-premium brown spirit resurgence (the category increased by 2.2 percent in 2015). For Canadian, one of the main - if not THE most signifi cant – growth drivers was the excellent year enjoyed by the category's lead producer, Crown Royal. The Diageo brand grew more than 13 percent in 2015. Its importance is hard to overstate: Since 2010, Canadian has increased by 400,000 cases, even though it lost ground in the more value-priced U.S. bottled variants. At the same time, Crown Royal added 800,000 cases, offsetting all the losses within the category. Some of that growth has been due to new and differentiated offerings under the Crown Royal brand: Regal Apple and Northern Harvest Rye, especially. "We have a large footprint as one of the top fi ve brands in the U.S., with con- sumers coming from different generations across the country," says Jim Ruane, Brand Director for Crown Royal at Diageo. "That gives us a massive opportu- nity to bring education and new product knowledge to consumers who already know us." Crown Royal's newer variants, including the recently introduced Crown Royal Vanilla, have been able to build on the surge in fl avored American whis- keys. With different recipes - like Crown Royal Black, Crown Royal Select Barrel Coffey Rye, as well as fl avored Canadians - the brand has taken trends already strong in American whiskey and made them its own. Gender and demographic lines have been blurred as fl avor- and rye-inclined young consumers, especially women, migrate from vodka to brown spirits.